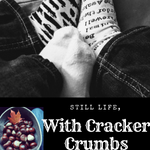 Gearing up for Storm Season | Still Life, With Cracker Crumbs..
Spring has arrived, and everything seems to be coming back to life. Birds are chirping in the trees, green shoots are emerging from the earth, the sun is shining brightly in the morning. However, spring in Michigan also means storm season has arrived, with severe storm and tornado watches and warnings. My dad works for disaster services, and has volunteered for the Red Cross for years and years. His prepper mentality has rubbed off on me over the years, and while I am not quite to my dad’s level, I am trying to be more prepared for what comes our way, especially with a toddler who I want to keep safe at all times. So with my dad’s input, I put together a small Stormy Day Kit. The helmet is all my dad’s suggestion – I would never have thought that. He pointed out to me though that so many people are injured during tornados due to flying debris in their home that a helmet is a must, at least for Wyatt. Many times cities or organizations have bike safety awareness events in May, and often they hand out free helmets to kids. Keep an eye out for one of these events, and maybe you can score a free helmet for your safety kit. Or for your child to use while bicycling if they don’t have one already! The one in my picture is the one we put on Wyatt for bike rides or when he is outside in his gait trainer, but I hope to pick him up a spare at a bike safety event this month. First and foremost, a weather radio is a must. I really liked this one by Esky. It is small, easily portable, charged by a hand crank, charges your cell phone, and is solar powered in case you want to take it camping or hiking even. It’s water resistant, has an extra flashlight for you, and has AM/FM/WB stations. We just leave ours tuned to the weather band though during inclement weather. Flashlights, extra batteries are a given and easily added, and a first aid kit is another necessity, although one hopefully you never have to use, except to maybe steal a Band-Aid from. (although if you do, replace it!) I got this one at Target for less than five dollars! I am probably going to pick one up for my car’s summer adventure kit too. Non-perishable snacks and water are a good idea, in case you need to take cover for a while. I also added bubbles to help entertain Wyatt, since I wouldn’t want to run my phone’s battery down too much. I will probably also add a book, and some crayons and a coloring book as well. And since he is still a little guy, a diaper and wipes. You never know right? Kids need a diaper change at the worst times usually – just ask my friend Kelly! An extra phone charger to keep with your kit would be a great addition. Best to have all the chargers in my opinion. If you will need medication, remember to add that in as well, either add in some extra if you have it or grab it on the way to sheltering in an emergency. I also threw in some hand sanitizer, because I always have it with me. Lol. I also have two fabulous apps on my phone – Code Red and the FEMA weather app. Both are free and will keep you up to date on any emergency situations. Code Red actually alerted us to a hostage situation that was taking place nearby, where a man with a gun had barricaded himself into a building. We hadn’t been watching tv or anything, so we had no idea that it was happening. It really didn’t affect us, but it was a good thing to be aware of. Basically, it made me go check to see that all of our doors and windows were locked. So it was good to have. I will add though, that they do seem to notify me a lot, especially the FEMA app. I don’t know if there are settings I can adjust but it is definitely something to be aware of, especially if that is something that will affect your phone plan and charges. Your own stormy day kit can be personalized and customized to fit your needs and your family’s need, based on age of kids, no kids, pets, and geographic area. For more ideas, check out Fema.gov and Ready.gov and to just learn more about how to safe this spring and summer. They have all the instructions on what to do during all sorts of weather – they are the experts! I am not a professional or anything, just a person who tries to be prepared and organized. (tries, being the key word!) And that reminds me- I am going to add a whistle to my stormy day kit. Please make sure to do the research necessary to keep your own family safe – these are just my ideas and what I have in my own kit as suggestions and to get you thinking about what you need for where you live and for your family. A starting off point, if you will. If you do end up making a stormy day kit, I would love to hear what you learned from your research and what you added to yours! P.S. This is not an affiliate post! Oh wow, I didn’t know Michigan had tornado warnings!